Our team works with a lot of great venues in the St. Louis area! Today we are offering some insight on which venues are our favorites, and what sets them apart for great productions and unique events! 1. The Caramel Room- Bissinger’s Chocolate Factory: The Caramel Room may be located inside of a chocolate factory, but that’s not the only great feature about this unique venue. The room itself is beautifully decorated and a wonderful place to hold a corporate or nonprofit event. It offers a large pre/post-function space where a band or DJ can play at a cocktail hour before doors open, or at an after party. The beautiful outdoor terrace overlooking North City and Stan Musial Bridge offers seating and fire pits for guests to enjoy. The main room is small making it impractical for an event to feature rear projection, but we have creative ways to make front projection work just as well in the space. In addition to providing projection in this venue, our team usually sets up sound for the DJ or band and flat screen monitors to display video loops or client logos. In a room this beautifully decorated, even a small number of lights goes a long way, as we can use lighting to highlight architectural details and decor to bring an event to the next level. TSV has done a lot of great events in The Caramel Room and we always get a piece of chocolate or two when doing a site survey! 2. South Grand Ritz Park: This versatile outdoor venue is in a great location and perfect for movie nights, band concerts and presentations. No matter the size of the event, our team has creative A/V solutions that we can utilize in this venue! For smaller events that may feature a solo musician, we can bring in as little as two powered speakers. Although the space is intimate, it accommodates larger productions for which we can bring in a truss supported system with Genie Lifts to fly our audio and lighting package, allowing for better coverage. A projection screen of up to 12’x20’ or an LED video wall of any size can be used to display company logos or other images. With all the possibilities, our team has done many successful events at South Grand Ritz Park including Fall Fest coming up on Sept.16! 3. 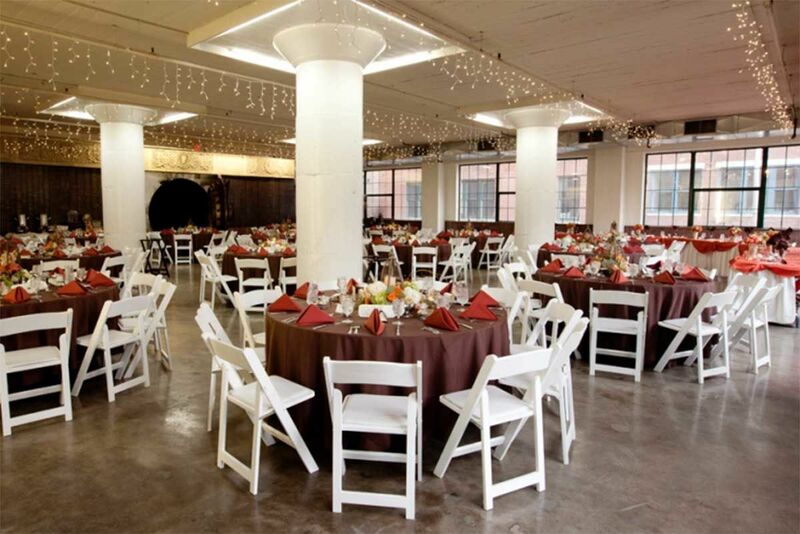 City Museum –Architecture Hall & Vault Room: The City Museum is a one of a kind venue that features Architecture Hall and the Vault Room, perfect for wedding receptions and small corporate events. Architecture Hall contains a nice turn-of-the-century bar and a dance floor that guests can enjoy. The Vault Room has a vintage feel with its double vault doors, antique safety deposit boxes and vintage Vess Soda bottles that adorn the walls. 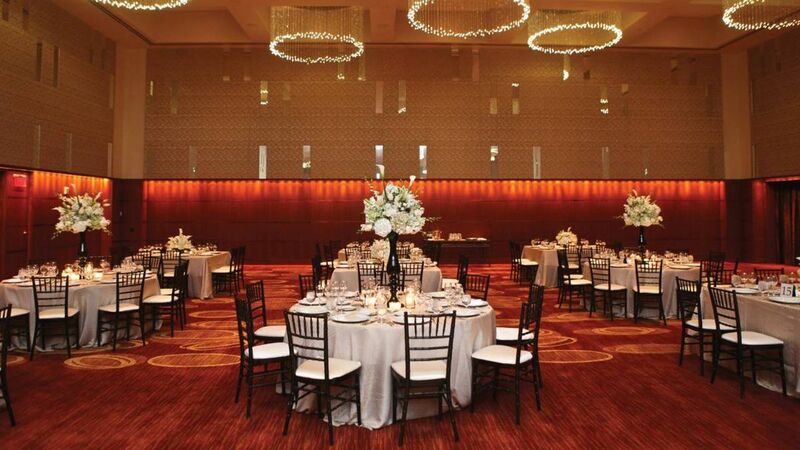 Our team has provided many DJ/wedding sound systems and flat screen TVs in these rooms. Both spaces have ample power for smaller sound systems and LED lighting, but neither room has a dedicated high-output power source. Of course, lighting equipment is traditionally responsible for the largest amount of power draw at an event, and TSV has some great solutions for that! Our LED lekos can light up a stage or project a gobo with a fraction of the power of a conventional leko. And TSV carries the largest inventory of battery powered LED lights in St. Louis, so we can uplight the entire space with no impact on the venue's power! 4. 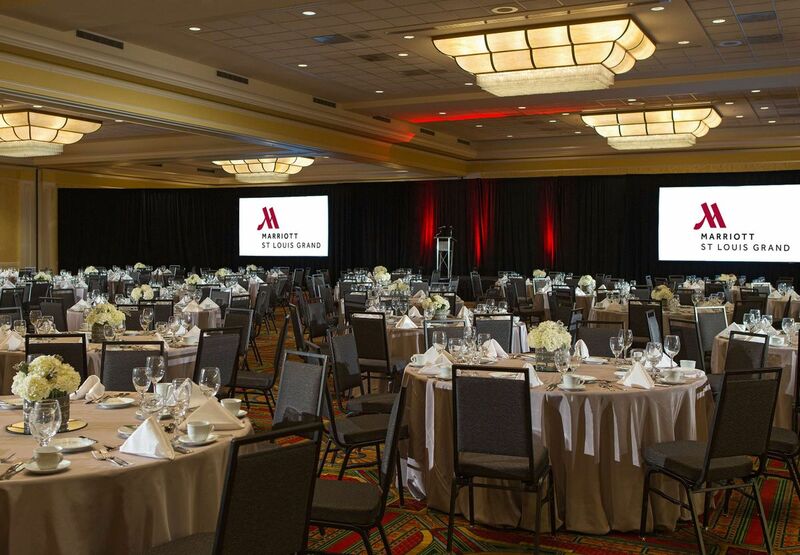 Marriott Grand St Louis – Majestic Ballroom: This Washington Avenue venue features The Majestic Ballroom that is used primarily for medium to large corporate events or galas accommodating 1,400-1,700 guests. With 100 amp 3-phase power, large scale production is made easy and the room features rigging points offering many possibilities. For example, the rigging points allow us to do a proper downstage lighting truss which keeps lights from shining directly into the presenter’s eyes, as well as flying our audio for more precise coverage at your event. The venue’s features help our team produce seamless events every time! 5. Four Seasons – Downtown St. Louis: The Four Seasons is in a prime location and can fit about 500 guests for a corporate or gala event. The pre-function space is great for a cocktail hour and can hold a small band or DJ on a stage. Uplighting, string lighting and battery powered LED lights have been used for events in the pre-function space and add an extra flare to the room. There are various ways to make an event more visually appealing in this venue. One way is for the hotel to hang 2-3’ wide banners that we can uplight, as well as modern LED chandeliers with effects and colors to catch guests’ eyes! A lot of successful events have been held at The Four Seasons and your guests can also enjoy the balcony overlooking the Mississippi River! These venues may be our favorites, but our team is always excited to work with new venues in the St. Louis area to produce seamless events! Contact us today if you have any questions! Images courtesy of South Grand, City Museum, Marriott Grand St. Louis and the Four Seasons.